It's Billy's Blog: Me. Want. This. 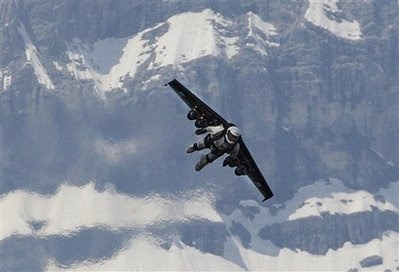 CUTLINE: Yves Rossy, known as the 'Fusion Man,' flies with a jet-powered single wing over the Alps in Bex, Switzerland, Wednesday, May 14, 2008. Some people go fishing on their day off. Yves Rossy likes to jump out of a small plane with a pair of jet-powered wings and perform figure eights above the Swiss Alps. The revolutionary human flying machine comes after five years of training and many more years of dreaming. Suddenly, I won't have to drive to work. I imagine it uses about as much fuel as my car, though. god, if drivers in the Peoria area weren't bad enough, imagine if they were staring out their windows at all the rocket-people floating by. Similarly, would you trust the average Peoria driver in one of these? Not I, good sir.